MSC Cruises (Italian: MSC Crociere) is a global cruise line registered in Switzerland and based in Geneva. It was founded in Naples, Italy in 1960. MSC Cruises is the world's largest privately held cruise company, employing about 23,500 people worldwide and having offices in 45 countries as of 2017. MSC Cruises is part of the Mediterranean Shipping Company S.A. (MSC), the world's second biggest container shipping operator. MSC Cruises is the fourth largest cruise company in the world, after Carnival Corporation & plc, Royal Caribbean Cruises Ltd. and Norwegian Cruise Line Holdings with a 7.2% share of all passengers carried in 2017. MSC Cruises was founded as Lauro Lines (Italian: Flotta Lauro) in Naples, Italy by Achille Lauro in 1960. The company entered the cruise business operating two ships, the Angelina Lauro and MS Achille Lauro. The Angelina Lauro burnt in the port of St. Thomas, United States Virgin Islands in 1979 and the Achille Lauro was hijacked by members of the Palestine Liberation Front in 1985. In 1989, the Mediterranean Shipping Company bought Lauro Lines and renamed it StarLauro Cruises. In 1994, the Achille Lauro caught fire and sank. In 1995, the company name was changed to MSC Cruises. 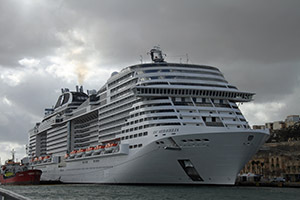 In 2014 MSC Cruises announced that the four Lirica class ships underwent renovation under the "Renaissance Programme". 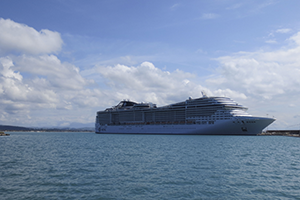 In 2015, MSC Cruises had four new ships on order from STX France and Fincantieri, with options for three more. 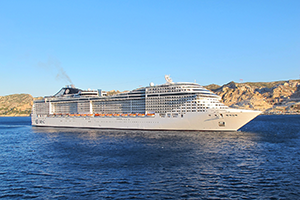 The first three ships were delivered in May 2017 (MSC Meraviglia), November 2017 (MSC Seaside) and June 2018 (MSC Seaview). There are four more diesel-powered ships on order for delivery in 2020s. In July 2018, the company announced that it would build the second cruise terminal in PortMiami for its World-class cruise ships. 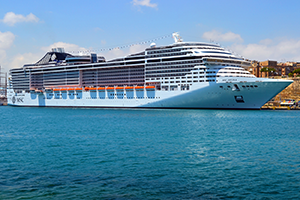 In January 2019, MSC Cruises officially presented the world’s first virtual personal cruise assistant - ZOE, an artificial intelligence device. MSC Grandiosa. Will enter service for MSC: November 2019. Gross tonnage: 181,000. Slightly larger than the Meraviglia Class. Construction started on 15 November 2017. Christening is planned for 2 November 2019 in Hamburg. MSC Virtuosa. Will enter service for MSC: September 2020. Gross tonnage: 181,000. Slightly larger than the Meraviglia Class. MSC Seashore. Will enter service for MSC: May 2021. Gross tonnage: 169,380. World-class I. Will enter service for MSC: 30 May 2022. Gross tonnage: 205,700. LNG-fueled cruise ship. Project Seaside Evo II. Will enter service for MSC: Fall 2022. Gross tonnage: 169,380. Luxury-class I. Will enter service for MSC: Spring 2023. Gross tonnage: 64,000. Meraviglia-plus-class III. Will enter service for MSC: 2023. Gross tonnage: 181,000. Luxury-class II. Will enter service for MSC: 2024. Gross tonnage: 64,000. World-class II. Will enter service for MSC: 2024. Gross tonnage: 205,700. LNG-fueled cruise ship. Luxury-class III. Will enter service for MSC: 2025. Gross tonnage: 64,000. World-class III. Will enter service for MSC: 2025. Gross tonnage: 205,700. LNG-fueled cruise ship. Luxury-class IV. Will enter service for MSC: 2026. Gross tonnage: 64,000. World-class IV. Will enter service for MSC: 2026. Gross tonnage: 205,700. LNG-fueled cruise ship.